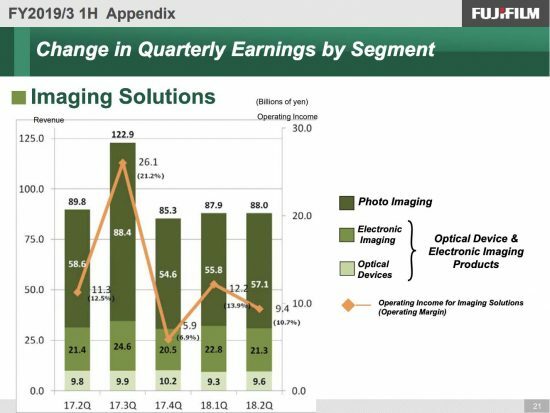 In the Imaging Solutions segment, consolidated revenue amounted to ¥175.9 billion (up 0.6% from the same period of the previous fiscal year), reflecting solid sales in all businesses. 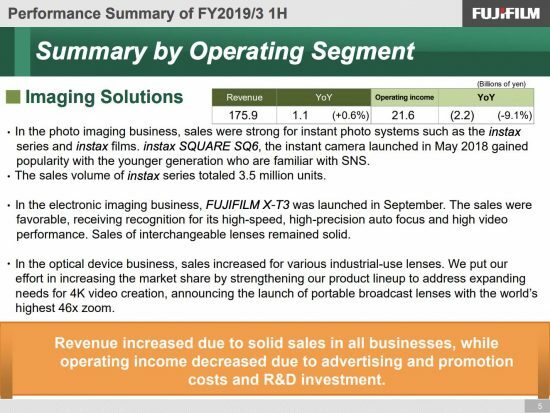 Consolidated operating income amounted to ¥21.6 billion (down 9.1% from the same period of the previous fiscal year), due to advertising and promotion costs and upfront investments such as R&D. In the photo imaging business, overall sales increased especially in instant photo systems which enable users to enjoy on-the-spot printing of photos, such as the instax series and instax films. Instax SQUARE SQ6, the instant camera launched in May 2018, has gained popularity with the younger generation who are familiar with SNS. In the electronic imaging field of the optical device and electronic imaging business, overall sales increased, supported by the successful launch of FUJIFILM X-T3 in September 2018. The sales of interchangeable lenses were also favorable as the sales of high-end models increased. 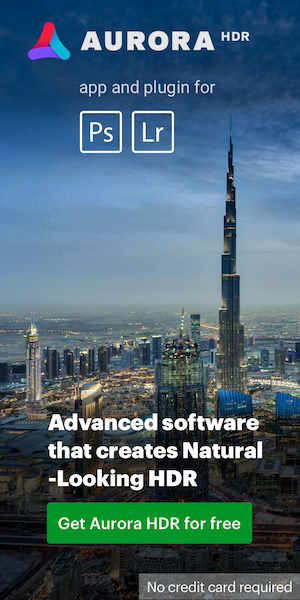 This entry was posted in Fuji and tagged financial results. Bookmark the permalink. Trackbacks are closed, but you can post a comment.